Bolanle, a graduate, disappoints her ambitious mother when she announces her intention to marry. Not only is Bolanle rejecting the path her mother hoped for her, she’s going to become the fourth of a polygamous man. The other wives, illiterate all of them, treat Bolanle with suspicion; they don’t like the way that Bolanle is regarded as some kind of trophy because of her academic achievements and they make no secret of their dislike. However, things take a sinister turn when Bolanle unwittingly threatens to expose a terrible secret in the household. “The Secret Lives of Baba Segi’s Wives” is narrated in turns by the adult members of the household. While this has some advantages in revealing the story bit by bit, building up the tension and gradually exposing the web of deceit on which the household precariously hangs, I did find it difficult to distinguish between the voices of the first three wives for at least the first half of the book. While this didn’t really act as a barrier to my understanding of the story, or my enjoyment generally, it does highlight a weakness in characterisation. There are no such problems with Baba Segi: he’s every bit the boorish patriarch, interested only in having a cluster of kids at his feet to demonstrate his virility, and filling his big belly each evening. The reader learns very quickly just what kind of man he is, ruling his household with an iron fist, but it’s his persistent belly-ache, something he takes to mean that there is something amiss in this household, that exposes his simplicity and his lack of education. Eventually we learn why Baba Segi favours a polygamous lifestyle but not before we learn why women, each strong in their own way, would agree to participate in such a practice in a contemporary society that does not demand it. This novel is an open window into modern Nigeria and the author effortlessly paints a vibrant and colourful portrait of both rural and urban people and attitudes. It’s a story of contrasts that are subtle but crystal clear. It’s a society where men make the rules and virility is commensurate with status and power, but one in which women can make or break a man’s reputation. From business practices to domestic details, the novel introduces the reader to Nigerian life without ever seeming too didactic. Even the names of the characters are explained in a subtle way. “Baba Segi” means father of Segi, his oldest child, while Segi’s mother is Iya Segi; Iya Tope is so called because her oldest child is Tope. A father however, is always referred to by the name of his first child; this in a country where great importance is placed on one’s status as a parent. It’s an immensely readable story, told with much humour but I felt that once or twice the humour threatened to overshadow the tragic moments. There is real sadness and even violence in the story which I felt was usually too quickly forgotten. While Babi Segi’s character is brilliantly developed, there was a tendency to portray him as a larger than life clown which detracted from the horror of his behaviour at times. That said, I found the book quite shocking in places, as I guess I was supposed to. The author does not make an outright condemnation of polygamy, after all, the four wives each have different reasons for their choice, but does show how Nigerian society regards it, condemning it in one breath, then silently looking the other way when it makes them uncomfortable. Lola Shoneyin has produced a story that appears at first lightly woven but proves to be hiding a very serious and moving tale. The shades of light and dark are well balanced and the narration is finely nuanced to draw up a picture of a modern Nigeria that is struggling to throw off the past. It’s colourful, dramatic, enlightening and emotive without being overly sentimental. A gripping and compelling read. Published by Serpant’s Tail (April 2010), 256 pages. Thanks to Serpant’s Tail for providing a free review copy of the book. 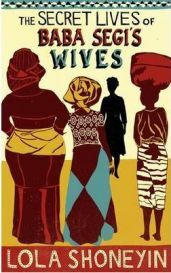 One Comment on "The Secret Lives of Baba Segi’s Wives"
Just to say that as a Nigerian, I think I know the parts that the reviewer found shocking – sadly they are all too common in Nigeria. I personally think Lola Shoneyin pulled her punches! I believe the difficulty the reviewer had in distinguishing the voices may be rooted in the fact that part of Shoneyin’s style is a unique rendering of linguistic norms and idiosyncrasies of the Yoruba language (proverbs, etiquette, specific greetings etc) that may be of necessity somewhat similar in tone. However, I feel the characters were well delineated and I was easily drawn in to the world of Baba Segi’s household by the skill and charm of the author who spins her tale with the assurance of an established literary voice.